I watch a lot of Australian Youtuber's (namely Lauren Curtis and Shanxo) who do rave about L'Oreal True Match Foundation, such foundation does look flawless on camera and at £9.99 it is very reasonably priced. What I like about L'Oreal True Match Foundation is the huge and I mean huge colour selection, they have warm, cool and neutral shades which I have never encountered from any other "drugstore" brand. I will of course review in full in the weeks coming but at the moment I can say that I am impressed by both the coverage and lasting power. So far so good, who said a good foundation has to break the bank? You may have seen the new L'Oreal Color Riche Eyeshadows pop up on the likes of Instagram and what not? Yes me too and I overlooked the range until I went into my local Boots, I instantly honed in on the new L'Oreal Color Riche Lumiere Eyeshadows and the rest they say is history. Basically they remind me of L'Oreal's Color Infalliable Eyeshadows had the been fully pressed. A light, almost gel like formulation that is laden with pigmented and a funky embossed print. Again I've only had these a few days but I will admit that I am hoping to find a champagne, highlight shade from this collection. I decided on a whim that I needed L'Oreal (you'd think there was no other brand available in Boots the way I behave) Miss Manga Mascara but being a bit of a silly billy I accidentally purchased the bright Turquoise shade instead of black. Whoops. I kid you not when I say it is the brightest blue mascara I have ever seen and not at all my thing, luckily my younger sister is much more adventurous and is now the proud owner of bold blue lashes. You go Glen Coco. Speaking of being adventurous I have been a little more braver with my eyeliners - gone is black and in is deep shades such as plum and navy. Okay hardly the wackiest or most creative approach but one step at a time. I swear by Rimmel Scandaleyes Waterproof Khol Pencils - they are creamy soft, wear so well and are so affordable. I settled on the shade Purple which is a deep plum shade that really makes my blue/green eyes pop. 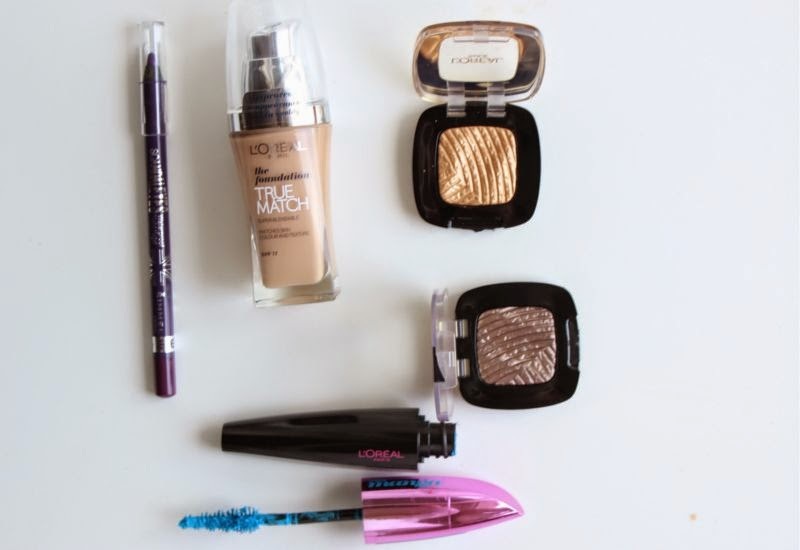 Has anything in the likes of Boots or Superdrug caught your eye recently?